I made this farm cake for a 3 year old little boy. I had a great time creating the characters on this cake. I baked two sponge cakes and covered the one cake in green and the other in blue fondant. I made the barn and characters out of fondant and tried to make a story out of this cake. Editors Note: I would say you definitely succeeded in creating a story! This is a really great looking cake, it would be great if you could explain a bit more of the details that went into this cake. Awesome job and thanks so much for sharing. 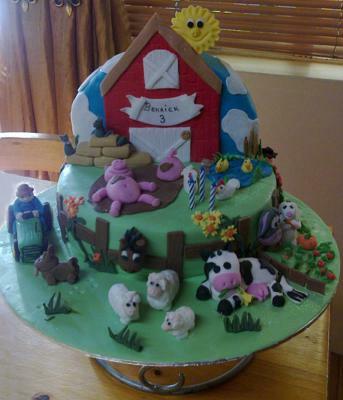 I love all of the details and how colorful and fun you have made this farm cake. Hi, I'm use to Marthie's cakes and cupcakes, there is no words to explain with the detail of every cake or cupcake she's creating. There's is so much love and care going into every cake she's decorating. Everytime she's baking a cake we can't wait to see what she is creating this time. You people should see her other cakes and cupcakes. Just say the word, and she will create exactly what you want. SHE IS AWESOME IN CREATING WHAT YOU, THE CLENT, WANT.